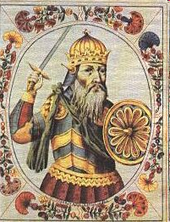 The Primary Chronicle records Sviatoslav as the first ruler of the Kievan Rus' with a name of Slavic origin (as opposed to his predecessors, whose names had Old Norse forms). 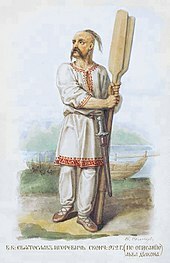 Nevertheless, Sveinald is the Old East Norse cognate with the Slavic form as attested in the Old East Norse patronymic of Sviatoslav's son Vladimir: Valdamarr Sveinaldsson. This patronymic naming convention continues in Icelandic and in East Slavic languages. Even in Rus', it was attested only among the members of the house of Rurik, as were the names of Sviatoslav's immediate successors: Vladimir, Yaroslav, and Mstislav. [need quotation to verify] Some scholars see the name of Sviatoslav, composed of the Slavic roots for "holy" and "glory", as an artificial derivation combining the names of his predecessors Oleg and Rurik (whose names mean "holy" and "glorious" in Old Norse, respectively). Sviatoslav's appearance has been described very clearly by Leo the Deacon, who himself attended the meeting of Sviatoslav with John I Tzimiskes. Following Deacon's memories, Sviatoslav was a bright-eyed, man of average height but of stalwart build, much more sturdy than Tzimiskes. He had bald head and a wispy beard and wore a bushy mustache and a sidelock as a sign of his nobility. He preferred to dress in white, and it was noted that his garments were much cleaner than those of his men, although he had a lot in common with his warriors. He wore a single large gold earring bearing a carbuncle and two pearls. 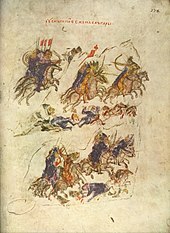 Pursuit of Sviatoslav's warriors by the Byzantine army, a miniature from 11th century chronicles of John Skylitzes. Madrid Skylitzes, meeting between John Tzimiskes and Sviatoslav. John Tzimiskes first attempted to persuade Sviatoslav into leaving Bulgaria, but he was unsuccessful. 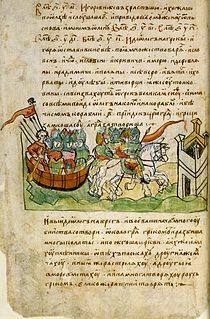 Challenging the Byzantine authority, Sviatoslav crossed the Danube and laid siege to Adrianople, causing panic on the streets of Constantinople in summer 970. Later that year, the Byzantines launched a counteroffensive. Being occupied with suppressing a revolt of Bardas Phokas in Asia Minor, John Tzimiskes sent his commander-in-chief, Bardas Skleros, who defeated the coalition of Rus', Pechenegs, Magyars, and Bulgarians in the Battle of Arcadiopolis. Meanwhile, John, having quelled the revolt of Bardas Phokas, came to the Balkans with a large army and promoting himself as the liberator of Bulgaria from Sviatoslav, penetrated the impracticable mountain passes and shortly thereafter captured Marcianopolis, where the Rus' were holding a number of Bulgar princes hostage. Fearing that the peace with Sviatoslav would not endure, the Byzantine emperor induced the Pecheneg khan Kurya to kill Sviatoslav before he reached Kiev. This was in line with the policy outlined by Constantine VII Porphyrogenitus in De Administrando Imperio of fomenting strife between the Rus' and the Pechenegs. 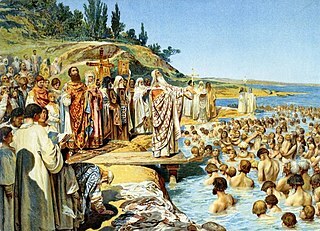 According to the Slavic chronicle, Sveneld attempted to warn Sviatoslav to avoid the Dnieper rapids, but the prince slighted his wise advice and was ambushed and slain by the Pechenegs when he tried to cross the cataracts near Khortitsa early in 972. The Primary Chronicle reports that his skull was made into a chalice by the Pecheneg khan. Among the works created during the war was Yakov Knyazhnin's tragedy Olga (1772). 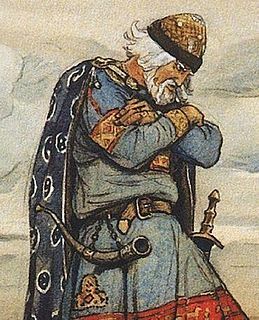 The Russian playwright chose to introduce Sviatoslav as his protagonist, although his active participation in the events following Igor's death is out of sync with the traditional chronology. Knyazhnin's rival Nikolai Nikolev (1758–1815) also wrote a play on the subject of Sviatoslav's life. Ivan Akimov's painting Sviatoslav's Return from the Danube to Kiev (1773) explores the conflict between military honour and family attachment. It is a vivid example of Poussinesque rendering of early medieval subject matter. Monument to Sviatoslav I in Kyiv, Ukraine. The authors are Boris Krylov and Oles Sydoruk. ^ "E.g. in the ''Primary Chronicle'' under year 970". Litopys.org.ua. Retrieved 6 July 2013. ^ "Svyatoslav I - Prince of Kiev". Online Encyclopædia Britannica. Britannica.com. Retrieved 23 November 2017. ^ "Vladimir I - Grand Prince of Kiev". Online Encyclopædia Britannica. Britannica.com. Retrieved 23 November 2017. ^ Stephenson, Paul (2000). Byzantium's Balkan Frontier: A Political Study of the Northern Balkans, 900-1204. Cambridge University Press. p. 56. ISBN 978-0-521-77017-0. Retrieved 24 November 2017. ^ Литвина, А. Ф.; Успенский, Федор Борисович (2006). Выбор имени у русских князей в X-XVI вв: династическая история сквозь призму антропонимики [The choice of personal names for the Russian princes of the 10th-16th centuries: a dynastic history through the prism of anthroponymy]. Труды по филологии и истории: Именослов, имя (in Russian). Индрик [Indrik]. p. 43. ISBN 5-85759-339-5. Retrieved 25 August 2016. ^ See А.М. Членов. К вопросу об имени Святослава, in Личные имена в прошлом, настоящем и будущем: проблемы антропонимики (Moscow, 1970). ^ If Olga was indeed born in 879, as the Primary Chronicle seems to imply, she should have been about 65 at the time of Sviatoslav's birth. There are clearly some problems with chronology. ^ Cross and Sherbowitz-Wetzor, Primary Chronicle, p. 84. ^ Vernadsky 276–277. The sidelock is reminiscent of Turkic hairstyles and practices and was later mimicked by Cossacks. ^ Based on his analysis of De Ceremoniis, Alexander Nazarenko hypothesizes that Olga hoped to orchestrate a marriage between Sviatoslav and a Byzantine princess. If her proposal was peremptorily declined (as it most certainly would have been), it is hardly surprising that Sviatoslav would look at the Byzantine Empire and her Christian culture with suspicion. Nazarenko 302. ^ Froianov, I. Ia. ; A. Iu. Dvornichenko; Iu. V. Krivosheev (1992). "The Introduction of Christianity in Russia and the Pagan Traditions". In Marjorie Mandelstam Balzer (ed.). Russian Traditional Culture: Religion, Gender, and Customary Law. M.E. Sharpe. p. 4. ISBN 978-1-56324-039-3. Retrieved 19 February 2017. ^ Shared maternal paternity of Yaropolk and Oleg is a matter of debate by historians. ^ She is traditionally identified in Russian historiography as Dobrynya's sister; for other theories on her identity, see here. ^ Indeed, Franklin and Shepard advanced the hypothesis that Sfengus was identical with Mstislav of Tmutarakan. Franklin and Shepard 200-201. ^ Christian 345. It is disputed whether Sviatoslav invaded the land of Vyatichs that year. The only campaign against the Vyatichs explicitly mentioned in the Primary Chronicle is dated to 966. ^ Russian Primary Chronicle (ПСРЛ. — Т. 2. Ипатьевская летопись. — СПб., 1908) for year 6472. The chronicler may have wished to contrast Sviatoslav's open declaration of war to stealthy tactics employed by many other early medieval conquerors. ^ For Sviatoslav's reliance on nomad cavalry, see, e.g., Franklin and Shepard 149; Christian 298; Pletneva 18. ^ Christian 298. The Primary Chronicle is very succinct about the whole campaign against the Khazars, saying only that Sviatoslav "took their city and Belaya Vezha". ^ The town was an important trade center located near the portage between the Volga and Don Rivers. By the early 12th century, however, it had been destroyed by the Kipchaks. ^ See, generally Christian 297–298; Dunlop passim. ^ Artamonov 428; Christian 298. ^ The campaign against the Ossetians is attested in the Primary Chronicle. The Novgorod First Chronicle specifies that Sviatoslav resettled the Ossetians near Kiev, but Sakharov finds this claim dubitable. 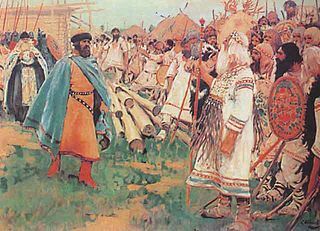 ^ The Mandgelis Document refers to a Khazar potentate in the Taman Peninsula around 985, long after Sviatoslav's death. Kedrenos reported that the Byzantines and Rus' collaborated in the conquest of a Khazar kingdom in the Crimea in 1016, and still later, Ibn al-Athir reported an unsuccessful attack by al-Fadl ibn Muhammad against the Khazars in the Caucasus in 1030. For more information on these and other references, see Khazars#Late references to the Khazars. ^ Most historians believe the Greeks were interested in the destruction of Khazaria. Another school of thought essentializes the report of Yahya of Antioch that, prior to the Danube campaign, the Byzantines and the Rus' were at war. See Sakharov, chapter I. ^ The exact date of Sviatoslav's Bulgarian campaign, which likely did not commence until the conclusion of his Khazar campaign, is unknown. ^ Mikhail Tikhomirov and Vladimir Pashuto, among others, assume that the Emperor was interested primarily in diverting Sviatoslav's attention from Chersonesos, a Byzantine possession in the Crimea. Indeed, Leo the Deacon three times mentions that Sviatoslav and his father Igor controlled Cimmerian Bosporus. If so, a conflict of interests in the Crimea was inevitable. The Suzdal Chronicle, though a rather late source, also mentions Sviatoslav's war against Chersonesos. In the peace treaty of 971, Sviatoslav promised not to wage wars against either Constantinople or Chersonesos. Byzantine sources also report that Kalokyros attempted to persuade Sviatoslav to support Kalokyros in a coup against the reigning Byzantine emperor. As remuneration for his help, Sviatoslav was supposed to retain a permanent hold on Bulgaria. Modern historians, however, assign little historical importance to this story. Kendrick 157. ^ All figures in this article, including the numbers of Sviatoslav's troops, are based on the reports of Byzantine sources, which may differ from those of the Slavonic chronicles. Greek sources report Khazars and "Turks" in Sviatoslav's army as well as Pechenegs. As used in such Byzantine writings as De Administrando Imperio by Constantine Porphyrogenitus, "Turks" refers to Magyars. The Rus'-Magyar alliance resulted in the Hungarian expedition against the second largest city of the empire, Thessalonica, in 968. ^ Boris II was captured by the Byzantines in 971 and carried off to Constantinople as a prisoner. ^ Simultaneously, Otto I attacked Byzantine possessions in the south of Italy. This remarkable coincidence may be interpreted as an evidence of the anti-Byzantine German-Russian alliance. See: Manteuffel 41. ^ Grekov 445–446. The Byzantine sources report the enemy casualties to be as high as 20,000, a figure modern historians find to be highly improbable. 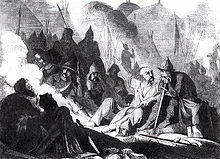 ^ Constantine VII pointed out that, by virtue of their controlling the Dnieper cataracts, the Pechenegs may easily attack and destroy the Rus' vessels sailing along the river. ^ The use of a defeated enemy's skull as a drinking vessel is reported by numerous authors through history among various steppe peoples, such as the Scythians. Kurya likely intended this as a compliment to Sviatoslav; sources report that Kurya and his wife drank from the skull and prayed for a son as brave as the deceased Rus' warlord. Christian 344; Pletneva 19; Cross and Sherbowitz-Wetzor 90. ^ "Велимир Хлебников Творения". Lib.rus.ec. Retrieved 17 June 2012. ^ (Moscow: Det. lit., 1989). 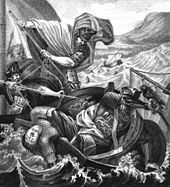 ^ "On Khortitsa found the sword of Prince Svyatoslav". Rest in Ukraine. 23 September 2011. Retrieved 23 November 2017. Wikimedia Commons has media related to Sviatoslav I of Kiev. Barthold, W.. "Khazar". Encyclopaedia of Islam (Brill Online). Eds. : P. Bearman, Th. Bianquis, C. E. Bosworth, E. van Donzel and W.P. Heinrichs. Brill, 1996. Chlenov, A. M. (А. М. Членов.) "K Voprosu ob Imeni Sviatoslava." Lichnye Imena v proshlom, Nastoyaschem i Buduschem Antroponomiki ("К вопросу об имени Святослава." Личные имена в прошлом, настоящем и будущем: проблемы антропонимики) (Moscow, 1970). Cross, S. H., and O. P. Sherbowitz-Wetzor. The Russian Primary Chronicle: Laurentian Text. Cambridge, Mass. : Medieval Academy of America, 1953. Dunlop, D. M. History of the Jewish Khazars. Princeton Univ. Press, 1954. Golden, P. B. "Rus." Encyclopaedia of Islam (Brill Online). Eds. : P. Bearman, Th. Bianquis, C. E. Bosworth, E. van Donzel and W. P. Heinrichs. Brill, 2006. Nazarenko, A. N. (А.Н. Назаренко). Drevniaya Rus' na Mezhdunarodnykh Putiakh (Древняя Русь на международных путях). Moscow, Russian Academy of Sciences, World History Institute, 2001. ISBN 5-7859-0085-8. Pletneva, Svetlana. Polovtsy Moscow: Nauka, 1990. ISBN 5-02-009542-7. Vernadsky, G. V. The Origins of Russia. Oxford: Clarendon Press, 1959. Vsevolod I Yaroslavich, ruled as Grand Prince of Kiev from 1078 until his death. Igor I was a Varangian ruler of Kievan Rus' from 912 to 945. The Principality of Chernigov was one of the largest states within Kievan Rus'. For a time the principality was the second most important after Kiev. Kurya was the name of a Pecheneg prince and khan who allied with Svyatoslav I of Kiev in his campaigns in the Balkans. Later, after Svyatoslav's defeat by the Byzantine Empire, Kurya ambushed and killed the Kievan king at Khortitsa. According to the Chronicle of Bygone Years, Kurya had Svyatoslav's skull made into a goblet, and gilded. Dates of his rule are unknown, but he was no longer khan somewhere around 988 CE, being succeeded by Metiga. It is also possible that he was the leader of the Pechenegs in the 968 siege of Kiev, but since a starting date is unknown, it is almost impossible to tell. Kurya appears as a villain in the 2006 animated film Prince Vladimir.